Flower, Sun, and Rain– for fans of Suda51, this name might ring a bell. Although for most others, it may be met with a level of confusion. This game was originally released by Grasshopper Manufacture on the PlayStation 2 in Japan in 2008, and was brought to the US for the Nintendo DS in 2009. It’s quite the mixed bag of an experience, to say the least. It serves as a semi-sequel/companion to The Silver Case, which interestingly wouldn’t get localized until nearly a decade later. It very well may be Suda51’s most under-the-radar US release. There is a reason for this- as a game, it’s difficult to get into. Though beneath the imposing exterior lies a uniquely written adventure game. Seeing as this game never saw much attention after its initial release, it’s worth looking back onto this fascinating piece of Grasshopper Manufacture history to see what it did right, and what it did wrong. As it turns out, it did quite a bit of both. 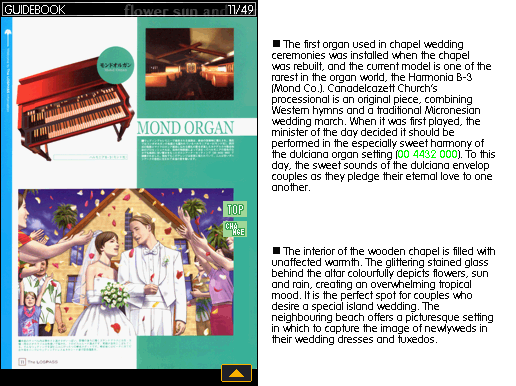 Where Flower, Sun, and Rain immediately shines is in its worldbuilding, helped considerably by a lengthy guidebook to the settings around the player, as well as plenty of quirky characters and a fascinating plot. Things start off simple: Sumio Mondo was called to Lospass Island to stop a terrorist from setting off a bomb within a plane, though things quickly take a turn strange when each day starts to seemingly repeat itself. Every day ends with a plane flying through the sky and blowing up, reminding Sumio that he has failed his task. Then he wakes up in the same hotel room, only to find the entire island around him seems to have “reset”. The player will experience a different version of the same day, endlessly repeating until they get to the bottom of the mystery of this island that seems to be stuck on repeat. Not only the plot, but the dialogue itself is always entertaining. It’s presented in a stream-of-consciousness style that Suda51 games do so well, and while you won’t always understand exactly what is going on, it’s hard not to be enthralled by the hilarious, anything-goes nature of the conversations. It’s a unique psychological mystery that goes to a wide number of unexpected places, and is certainly one of the best parts of a game that is balanced out with less-shining aspects. The game itself consists of the player running around as Sumio, looking for the next puzzle to solve or character to talk to. That alone isn’t a bad thing- what’s bad is the fact that you’ll be running around for huge stretches of time. Getting from place to place can take an easy 5 minutes of pure running. There isn’t much to look at or do on the way there, either. 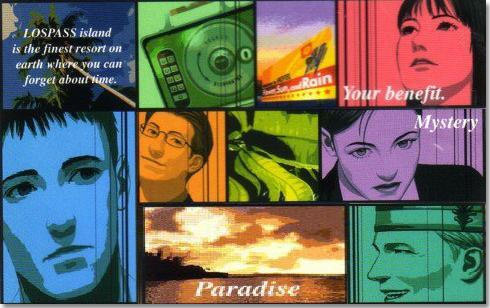 It’s just you, the player, holding down buttons on the D-pad until you’ve reached your destination. 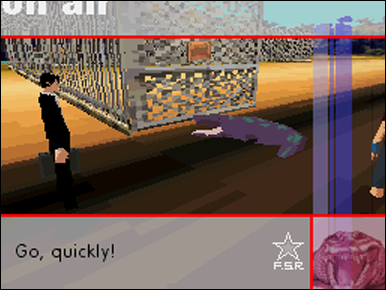 It’s not even as simple as holding down the “forward” button, either- the camera is so wonky that players will have to constantly adjust the direction Sumio is running in order to prevent him from running into a wall. It’s slow and monotonous gameplay that will test even the most patient of players. If that wasn’t enough, we haven’t even gotten started talking about the puzzles. Simply put: they’re insane. They often involve extremely obtuse clues that the player will need to use the in-game guidebook to find the answer to, use strange adventure-game logic, perform fairly complex algebraic equations, or any combination of the three. Furthermore, every puzzle answer takes the form of a number that needs to be entered into a specific object in the game world. It’s a novel concept, to be sure; though it’s safe to say that this is one of Suda’s many video game experiments that did not entirely pan out in an effective way. Points for originality, at the very least. Unfortunately, “original” does not always equate to “good”. And while Suda51 certainly has provided several original and effective gaming experiences, this system of puzzles may be his least-successful experiment. Strangely enough, the characters of the game will often break the fourth wall and acknowledge the fact that this game isn’t all that fun- Sumio himself will lament his boring job of finding random objects and entering numbers into them on more than one occasion. Even the game knows that it’s a bit of a painful experience to play, and it suffers alongside you. It is monotonous on purpose. And while this is intriguingly postmodern, it’s still not all that fun to actually play. One of the FSR’s greatest strengths, and also one of its most unfortunate pitfalls, is its guidebook. 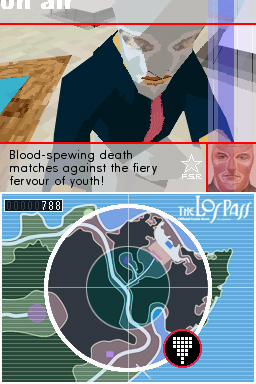 There is an entire 49-page virtual guidebook that can be accessed anytime from the pause menu that details the various attractions and events of Lospass Island. The topic of these pages can range from a detailed description of a landmark, the menu of a restaurant, an interview with a local celebrity, or more. From a worldbuilding standpoint, this guidebook does wonders, as it makes the relatively bare-bone world around you feel completely alive. There’s a surprising amount of text to read through and it certainly makes the world of Lospass much more interesting to live in. However, the integration of the guidebook with the game’s puzzles leads to far too many obtuse conundrums that most players will not be able to solve without the use of some sort of walkthrough. A peek inside one of the 49 pages inside the guidebook. Humorously, the image of the wedding couple was plagiarized by an artist at an ArtRabbit exhibition in 2017. We’ve spent a good amount of time critiquing the game, and while there is much to critique, the sheer amount of good that this game accomplishes should not go unnoticed. Alongside its memorable characters and atmosphere, its music is also excellent, and is surely one of the best out of Grasshopper’s catalog. It features some catchy original tunes, and as well as many remixes of existing music. These remixes range from jazz such as the Gershwin’s “I’ve Got Rhythm”, to Erik Satie’s “Gymnopédie No. 1”. It’s difficult not to fall in love with the updated keyboard-infused arrangements, and they definitely do justice to their source material. When Sumio is running around through the same bland environments, the soundtrack will always be there to put a pep in your step. Unfortunately, the sound quality of the original soundtrack was moved down considerably in the process of translating it to the DS, though the re-translated portable soundtrack is still a joy to listen to. Seriously, is this not the greatest?